Most kids’ programs, sailing schools included, bet that parents aren’t interested. Some even bet on parents to fail. Don’t get me wrong, I love sailing schools. I give as many volunteer hours as I can to the one in my town. They’re terrific places for kids to learn sailing skills and meet new friends, and if a student sticks around for a few years and shows a little gumption, they might have the chance to make a few bucks as an instructor when they’re old enough to work. But like soccer and baseball leagues, kids’ choirs, piano lessons and summer camps, most sailing schools are designed to serve kids until they’re not kids anymore. Only a few adults are deemed qualified and selected to be the coaches or counselors. The rest are left to drive the minivan and watch from the sidelines. They’ve been aced out, almost as if they’re not good enough. The premise is that kids must only be with other kids to learn to be good enough at what-ever-the-program is teaching and to gather some social skills. And there seems to be an unspoken undercurrent — a flawed assumption, I think — that if parents are around, it couldn’t possibly be as fun. As a young parent, I assumed the experts were right. When our first grade daughter came home with a flyer for a summer no-strikes baseball league, we did as was expected and signed her up, and then my wife and I took turns getting her to practices and we both tried to make all the games. I shot hours of video footage, and cheered like a drunken Cubs fan. A decade later, we still watch the clip (watch it below) where she hit an RBI single, and then fidgeted, danced and pretended to jump rope on first base until completely spacing out and forgetting to take off running when the next batter finally made contact. She was out. We had fun. But boy, did I want to participate. A few years ago, while working with a kids’ sailing school on new summer curriculum, we surveyed moms to learn if they would be interested in participating with their kids in some way. Our idea was that in a session of 10 sailing classes, one would be open. A mom could come down, put on a life jacket and go sailing to witness first-hand what her child had learned. Fifty percent replied that they were game. More interestingly, seventy percent of single moms were eager to go sailing. We were stunned. It was as if these moms had been waiting for an invitation. Admittedly, we misunderstood the real opportunity at first. As soon as we saw the survey data, we deemed the last class “parent day.” Then, out of 120 kids that summer, only two parents came down, and neither were ready to go sailing, opting, instead, to spectate from a safety boat. Our mistakes? We didn’t adjust the time of the class, leaving it mid-day Tuesdays, when most parents are working or doing errands. We didn’t provide the parents with any training, so climbing into a dinghy was scary. We didn’t go big enough. Moms’ wanted to learn to sail too; one day watching didn’t meet expectations. This schools’ sailing programs are a work in progress. Every year we adjust schedules to fit family needs. We’re exploring ways to adapt curriculum to teach families to sail together, or ways to train separately and then have them join up later. We’re searching for just the right boats to mix fast launching and rigging with exciting, fast sailing and that are affordable and durable. I said at the outset that most kids’ programs, sailing schools included, bet that parents aren’t interested. Our data proved that to be wrong. I also said that some programs even bet on the parent to fail. Consider that kids’ programs are often designed to occupy the free time of kids whose parents might not be around much. This isn’t surprising since the number of American kids who live with two parents is at an all time low, and the number of working parents is at an all time high. But I’m suggesting a completely different view informed by our simple survey and observations of modern families. Given the chance, many parents, even working single parents, will elect to do fun things with their kids. Some even carve out more spare time. 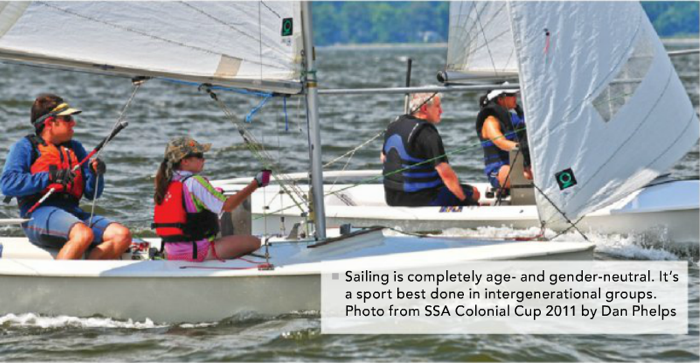 Sailing, unlike just about any other activity you can name, is completely age and gender neutral; something best done in intergenerational groups. As much fun for mom, dad or grandma as it is for kids… and then more fun for everyone. It’s time to bet on the parents. Take ‘em sailing. You are currently reading Betting on Sailing Parents at Saving Sailing.